FBX Adventures - (In Parenting): Christmas Eve! Merry Christmas Eve! I still can't believe that Christmas is here, but it is! While I didn't get everything done that I wanted to get done, I got about 80% finished. I did bake a ton of cookies. I also ate a ton of cookies. That didn't work out so well for me. With my new found knitting skills, I knit some gifts, but mostly crocheted random gifts. Knitting is addicting. If you don't knit, only start if you have an extra hour or two in your day. Haha! 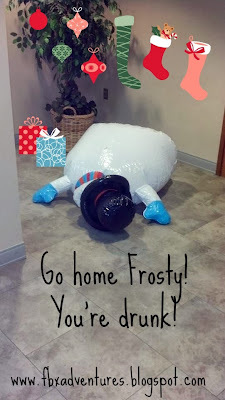 When I saw the picture, I thought the snowman had too much nog!